Please contact the owner directly@ 608-692-5469 or 2marieandmartin(at)gmail(dot)com.After nearly 30 years of boating, six Searay boats and now retired, we are getting out of boating and trying new adventures. We are selling our “home on the water”. 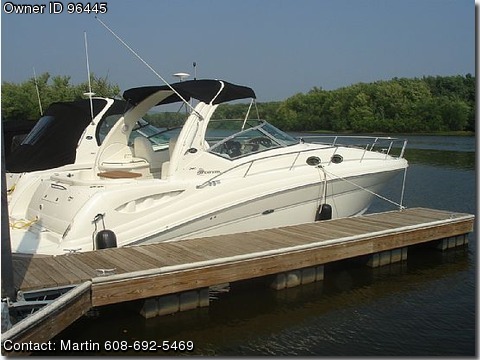 She’s a beautiful 37.5’ 2007 Searay 340 Sundancer. She was our Dreamboat and we will miss her. She’s powered by twin 496 Mercs. each producing 375 php, SS dual prop stern drives, drafting 26” with drives up and 37” with drives down. Kohler gen set with very few hours almost no use but run occasionally for maintenance. Cabin A/C, Central Vacuum System, Snap out Carpets in the helm, carpet liners below, 2 burner stove and microwave, full stand up head with shower, vacu-flush toilet, two flat screen TV’s and stereo Sirus radio with CD/DVD/ MP3 plug in. System is a NorthStar chart plotter with a current Jeppesen C-Map chart module. Remote windlass with all chain anchor line. Full canvas (black) including a cockpit canvas, bow pad for sunbathing, swim platform with swim ladder. Other equipment is listed on attached original invoice (see photos). She was bought in La Crosse, WI and moored in Prairie du Chien, WI only on the Mississippi river in fresh water.